Douglas Ward, the world’s leading expert on cruising and the author of the latest edition the Berlitz: Guide to River Cruising in Europe joins Paul and Elizabeth to talk about the positives of a river cruise vacation. The discuss why its so popular and which lines appeal to different markets and why. Find out which line served Paul the finest food he has ever had afloat. 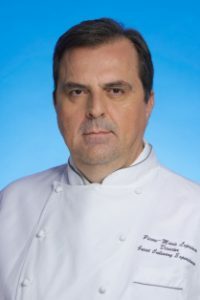 Chef Pierre-Marie LePrince, Director of Culinary Experience, Princess Cruises chats with Paul about the new dining experiences for the Princess fleet and some of his thoughts about what passengers want. They discuss trends and new ideas for dining at sea. Paul and Elizabeth sail on AMAWaterways newest ship, the AmaLea, through the Netherlands and Belgium during the height of the spring tulip bloom in April. The tulips are blooming and Holland is at her best. It’s a chance to experience a river cruise and visit some of the most interesting towns and cities, including Amsterdam, Rotterdam, Middleburg, Ghent, Bruges, and even a stop at Kinderdijk. The ship’s godmother is travel industry veteran Filomena Andre. The ship’s final stop is Amsterdam, where Paul and Elizabeth visit the Van Gogh Museum. Recently redone, the museum puts the great artist’s work into historical context. 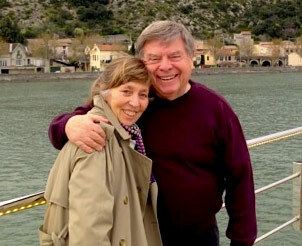 As they think about the ending of this week-long cruise, Paul and Elizabeth also share more about what life aboard ship is like and what each of them thinks was the best part of this remarkable river cruise. A week of river cruises aboard AMAWaterways newest ship, the AmaLea, Paul and Elizabeth continue their journeythrough the Netherlands and Belgium during the height of the spring tulip bloom in April. The tulips are blooming and Holland is at her best. Today, the ship stops in Rotterdam, where Paul and Elizabeth take the excursion to The Hague. Here, they visit the Mauritshuis, a former mansion that today houses some stellar paintings from the Dutch Golden Age, including works by Rembrandt, Vermeer, and Rubens. They also stop at the city’s legendary cafe Dudok, where they indulge in the best apple cake yet, served with cinnamon ice cream and a bowl of whipped cream. Paul and Elizabeth sail on AMAWaterways newest ship, the AmaLea. River Cruises through the Netherlands and Belgium during the height of the spring tulip bloom in Apri are at their best. It’s a chance to experience a river cruise and visit some of the most interesting towns and cities, including Amsterdam, Rotterdam, Middleburg, Ghent, Bruges, and even a stop at Kinderdijk. The ship’s godmother is travel industry veteran Filomena Andre. Today the ship stops in Middleburg, where Paul and Elizabeth hire a taxi to take them to nearby Veere, home of Elizabeth’s ancestors. In the 1600s, four Vandeveer brothers left from Veere to sail to what was then New Amsterdam and settled in what is now Flatbush. Three centuries later, the descendant of one of those brothers gave birth to Elizabeth’s mother, Marian Vandeveer Harryman. A visit to the town’s museum and a stop for apple cake and tea round out the day. Day Two of Paul and Elizabeth’s River Cruise adventure aboard AMAWaterways newest ship, the AmaLea, headsthrough the Netherlands and Belgium during the height of the spring tulip bloom in April. The tulips are blooming and Holland is at her best. It’s a chance to experience what river cruises have to offer and visit some of the most interesting towns and cities, including Amsterdam, Rotterdam, Middleburg, Ghent, Bruges, and even a stop at Kinderdijk. The ship’s godmother is travel industry veteran Filomena Andre. A highlight of any trip to the Netherlands this time of year is a visit to Keukenhof, the spectacular gardens outside Amsterdam. Each spring, the gardens open for just eight weeks. During that time, visitors can see the most amazing displays of tulips and other flowers. Paul and Elizabeth took the bus there from Haarlem. You can also take a bus to Keukenhof from Amsterdam or from Schiphol Airport. It’s easy and affordable; they show you how to do it and share what it’s like to be in these amazing gardens in spring. Paul and Elizabeth sail on AMAWaterways newest ship, the AmaLea, through the Netherlands and Belgium during the height of the spring tulip bloom in April. The tulips are blooming and Holland is at her best. It’s a chance to experience a river cruise and visit some of the most interesting towns and cities, including Amsterdam, Rotterdam, Middleburg, Ghent, Bruges, and even a stop at Kinderdijk. The ship’s godmother is travel industry veteran Filomena Andre. Before boarding the vessel in Amsterdam, Paul and Elizabeth spend two nights in nearby Haarlem, home to the Netherlands’ oldest museum, the Teylers, as well as the Frans Hals Museum, and the inspirational Corrie Ten Boom House. And they share what it was like to be in the Netherlands on King’s Day. Colonial-era buildings, trees crafted into topiary sculptures lining a park along the long beach, and mopeds whose drivers carry everything from mattresses to live ducks. On Paul and Elizabeth’s segment of Cunard Line’s 2018 World Cruise aboard Queen Mary 2, the couple tours the Vietnamese port city of Nha Trang. Visits to temples, a traditional pho lunch, and a look at the fishing boat harbor are among the highlights. What’s it like to program the activities for a world cruise? Paul and Elizabeth chat with Amanda Reid, Entertainment Director of Cunard Line’s QM2 on a segment of the ship’s 2018 World Cruise. Amanda oversees all the onboard activities from the guest lecturers to the orchestra playing for the tea dances. Having started out as a dancer, Amanda has spent much of her life at sea. Hear how that experience has given Amanda a global perspective on people and life. What’s the difference between a cruise ship and an ocean liner? Captain Peter Philpott, master of Cunard Line’s Queen Mary 2 joins Paul and Elizabeth to discuss what makes an ocean liner and how it feels to be in charge of the world’s only true liner. In the tradition of great mariners, Captain Philpott has spent a lifetime at sea. He shares his insights and world vision with Paul and Elizabeth.